I don’t have any pictures, but I do have many words for Vienna. Reminisce with me. It’s a Friday afternoon and I’m sitting here in the music, art, philosophy, high culture capital of the world eating a falafel wrap on an ordinary Austrian street corner, in the city that Gustav Klimt, Sigmund Freud, Mozart and Beethoven called home. I’m in that fevered, stupid state that I succumb to when I travel. I’ve not slept more than a few hours for the past three days. I arrive to my destinations always in a fog of wonder, curiosity, delirium, like I’m surprised to find that I’ve been swept up from the grave. Around me there is plenty of action but it is subtle and purposeful. There is commotion but it is contained and polite. People wait patiently for the pedestrian lights to turn green before crossing the street. Charles left and now I have myself, my own company, which sometimes I despise, but at the same time I am happy for the peace–to be able not to talk or think, only to feel and see. There are awkward silences in my inner dialogue, but I welcome the stillness, the not knowing. Traveling alone means nothing is fixed or concrete. Rarely do I have a solid opinion on how my day should go; mostly I just float along. With infinite choices, infinite ways to expend my energy, I find myself not wanting anything, only perfect, little, random moments. Anais Nin said, “I walk ahead of myself in perpetual expectancy of miracles.” And in Vienna, I do, and I have blisters on my feet. And now I’m at Café Central to prop my soles up, savoring a pear hazelnut mousse with a white wine glass wedged between my fingertips. It’s here that the Vienna Circle met and discussed the meaning, paradoxes, mysteries of this strange life, and it’s here that I sit and write about nothing, really. 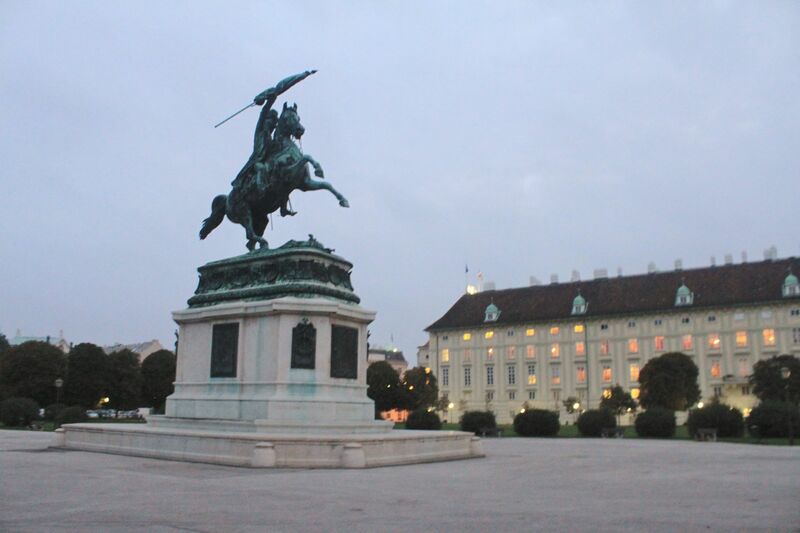 I write about how quiet and immaculate Vienna looks at 4:35 am, when my bus arrived. I write about the St. Stephen’s Cathedral in gothic shadows, illuminated by soft, criss-crossed lights. The haunting sanctity of its basement, the catacombs, which houses 11,000 human remains. I write about the intricacies of the Hofburg Palace, which is striking in its masculinity, but somehow still manages to be delicate, elegant, feminine. There is a balance of polished, epicene beauty which I cannot hope to capture. In the café, I relax, I observe, I eavesdrop. I casually thumb through an Austrian newspaper, pretending to know German. In these passive ways of passing time, I am participating in the quintessentially intangible heritage of Vienna–the unequaled Kaffeehaus culture–which is so subtle that if you blink, or hiccup, or nod off, you’ll overlook it, but if you’re awake, you’ll see that it’s clearly inherent in the atmosphere, and that it’s so important. Saturday brings a deluge of rich culture and warped time. It is an overwhelming rush of refined taste, profound beauty, warm faces, complex minds. It is the design of an elevated experience, a higher frequency of living. Vienna fills me with a sense of purpose; I am neither too relaxed nor too anxious at any given time. I feel that life, all life, is catapulting forward, and that I’m making an imprint on civilization just by being here. Of course, it’s not true; I’m just another tourist, but something feels different, like every interaction is significant, like the collective unconscious has a higher IQ. Vienna is bold, and I believe every word it speaks. On a bench in the palace gardens of Schloss Belvedere, I’m waiting for Lange Nacht der Museen to begin. Tonight more than 180 museums will open their doors and free their art from 6pm-1am, encouraging a mad dash of creative exploration and appreciation. While people around me are buzzing, whispering softly, eyes lit up with the wonder of seeing their favorite piece for the first or umpteenth time, I’m taking a moment to accept this phenomenon–this culture which feeds and fosters an artistic community with the utmost tenderness. Where pursuits of the intellect, the sharing of passion, and the exchange of enlightenment are commonplace. Vienna is big. Too big for the world, too big for death and stupidity and ugliness and ignorance. Today I let the Metro take me where it might, and I wind up in an alfresco antique market,where I spend my Euros all too easily. Relics of motley histories from around the world adorn the pavement and the surfaces of shabby tables. Blasé merchants flaunt vintage fabrics, cameras, tapestries, glasses, musical instruments, rare and knockoff heirlooms. I gravitate towards the old postcards and photographs, and grab a handful, studying them, trying to relive their stories. Neither my knowledge of history nor my level of German is very impressive, but I have an infinite appreciation for what has been, which guides me. I lose myself in this market, bartering from kiosk to kiosk over things I had no intention of buying. But in the end, I gave in and bought a warm scarf; a new ring with matching earrings that broke before the day’s end; a goblet engraved with scenes of rowdy bar folk vying for a young maiden. Fortunately for me, the Marktgebiet seamlessly feeds into a river of tourists heading east, and so I am carried along. At the delta sits the Naschmarkt, or heaven, where food is sold by weight, samples are given generously, everything is colorful and everyone thrives. The first thing to hit me in unknown territory is always the smell. In the market, exotic spices flood my nose and fill my entire being with warmth, a sensory ecstasy that is invasive and welcomed and which permeates all at once. I’m engaged in the displays of chopped fruit, tiny chocolates, blocks of cheese, slabs of meat, mixtures of olives, delicate slices of fish, bundles of flowers, and freshly prepared concoctions the way a scientist views a slide under the microscope. No detail must go unnoticed. There is a notion that the world is ours for the taking, that we humans are the grand participants. I’ve always scorned it, but in Vienna, where people seem to have evolution figured out, it seems plausible. Here, I can spread out my arms and spin around in circles, feeling everything swiftly, instantly, intensely and never once fearing that I might fall. 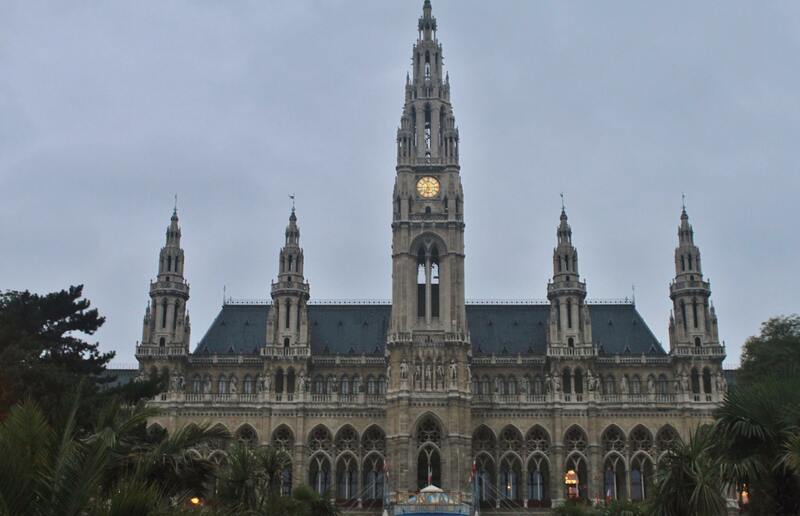 The Rauthaus, the town hall of Vienna. Designed by Friedrich von Schmidt in Neo-Gothic style. Lounging at Volksgarten, the wonderful rose garden of Hofburg Palace. 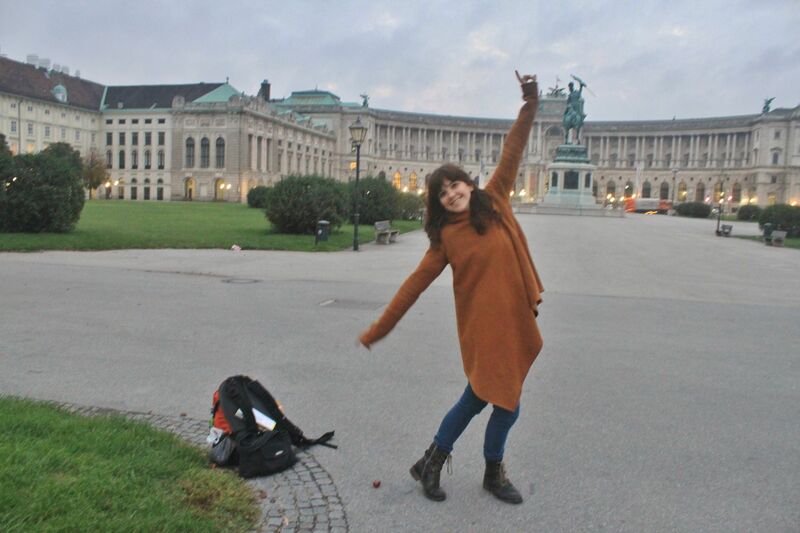 Full of energy at sunrise, Hofburg Palace. Panoramic view of the palace. Taking a walk through the palace grounds before dawn. We had the entire place to ourselves.